Update 4/12/17: We have issued an apology regarding ambiguities in this article. Update 3/12/17: We spoke to Richard Lewis in the wake of publishing this article. We would like to make it clear that his inclusion in this feature purely relates to the one-off Dreamhack incident and ban from Reddit, not any transphobic, homophobic, racist or misogynistic beliefs. He also wishes to clarify that the joke made in his acceptance speech was not about the Loda incident but rather a reference to his poor upbringing. Esports has a problem with representation. Through partnerships, awards, and simple success, the platforms, companies, and organisations associated with esports are being represented by people whose histories include racist, misogynist, homophobic, and/or transphobic views, as well as those with violent or deceptive pasts. You only need to look to the recent Esports Industry Awards, one of the events with the largest profile in the business, to see examples of this. Everyone attending, including the media and game makers themselves, were there to celebrate the best esports has to offer and everything great that has happened during the year just past – which is well-deserved considering how quickly the industry has grown, supporting more events, players, and talent each year. At the 2017 event, the winner of Esports Journalist of the year was Duncan ‘Thorin’ Shields, a journalist who has worked for the Eleague, DreamHack, and is currently working exclusively for Dot Esports. Almost a year ago, he put out a ‘females in esports’ video which argued along the same lines, and went into the “genetic” differences between men and women. Earlier this year, he simply denied the claim from SuperData that there is a near 50/50 split of women and men among viewers of gaming videos – he did not elaborate. While the Esports Journalist of the Year award is determined by a public nomination and a public vote, at no point did the EIA organisers voice any concern with the public’s choice, nor move to exclude him from nomination. 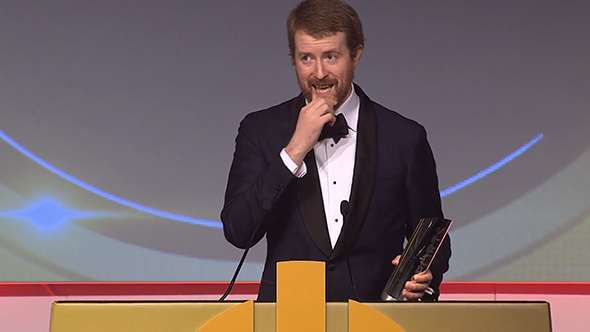 Shortly after the award for esports journalist of the year, Counter-Strike: Global Offensive was awarded the title of esports game of the year. In Valve’s place, the award was collected by Richard Lewis. To anyone who watched the Esports Industry Awards show or reads about it later, Shields and Lewis are now the face of esports journalism, and major players in the industry as a whole. Their peers are more than happy to celebrate them, as a glance at the EsportsIA Twitter account will show you. Their behaviour is legitimised because they have been recognised and celebrated by the industry. Twitch suspended TrainwrecksTV after the above tweet criticising his stream started gaining traction. However, that doesn’t undo the fact that Twitch had chosen to partner with him previously, and continue to do so after his five-day ban ended. Despite bans, popular streamers are often welcomed back by game developers. The story of Tyler1, a streamer prone to violently aggressive outburstswho had been permanently banned from League of Legends, didn’t just fade away – he became more popular than ever, with other streamers making jokes about and even including him in their content. Recently, Riot invited him back to the game. Even in cases where a streamer has deceived their fans, major games companies still offer them major sponsorship deals. In 2016, Trevor ‘TmarTn’ Martin was found to be an owner of CSGOLotto, a Counter-Strike: Global Offensive skin gambling site. Martin had been promoting the site without disclosing his stake in the company, or indicating that he was able to fix the odds so that he more frequently won while streaming the site. Despite this, Activision chose to partner with him to promote Call of Duty: WWII. The most distressing story so far has been that of Li ‘Vasilii’ Wei Jun, who was suspended from all play in League of Legends following a scene of domestic abuse that was caught on-stream. Police intervened and Wei Jun was later arrested. He has been given a 20 month suspension from competitive play. These are the faces of esports. In the case of Shields and Lewis, we saw them take to the stage at the Esports Industry Awards, their histories ignored and their work celebrated. But in some ways, things are getting better. Casting desks are, slowly, getting more diverse with people like Lauren ‘Pansy’ Scott, Eefje ‘Sjokz’ Depoortere, and Indiana ‘Froskurinn’ Black gaining popularity. And, broadly speaking, companies are realising that, yes, a toxic community that screams for hatred, sexism, racism, and abuse is bad. But any such progress is undermined when those that have presented racist, misogynist, and transphobic views, those that are accused of criminal acts of violence, and those that openly break a game’s rules in a damaging way for their own amusement, are put on a pedestal. It is no surprise that women find themselves the subject of abuse in the game industry: earlier this year, a player recorded a game of Overwatch rampant with sexism, and it is by no means an isolated example. Esports do not have to be aggressive. They do not have to be for men. They do not have to breed a culture where the worst jokes in society are parroted as memes rather than shot down as exclusionary. But the Esports Industry Awards – which was covered by news outlets from around the globe – sent out a stark message. Anyone that feels attacked by the esports industry is reminded that the source and product of their harassment are considered by the sector’s gatekeepers to be the best of the best. Until the face of Twitch’s section of popular streamers is no longer commonly filled with jokes about sexual abuse, and until the big names recognise that certain words are not acceptable, that is going to stay the same. It is imperative that the industry instead supports those participants who are inclusive, and offers platforms to anyone who will help esports and its surrounding culture grow in a more positive direction. In addition to those mentioned above, we also contacted DreamHack regarding this article – they too failed to provide any form of reponse.